The Model 4090 Aluminum folding walker is available in many configurations to fit most any need. The dual button release provides added security. 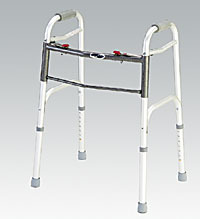 The walker folds down to only 4" in width for easy storage and transport. The durable, skid resistant rubber tips give added safety. This walker is available with a variety of options such as standard rear legs, 3" fixed rear wheels or 5" fixed rear wheels. The model 4090 is also available in many different height configurations for youth and adults.